March 22, 2017 by Robin S.
If I had to guess, I’d say that the biggest thing in gaming right now is the new Nintendo game, The Legend of Zelda: Breath of the Wild. 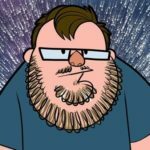 Since that game is less than a month old, it’s hardly appropriate for a Nerdstalgia or Patient Gamer review. 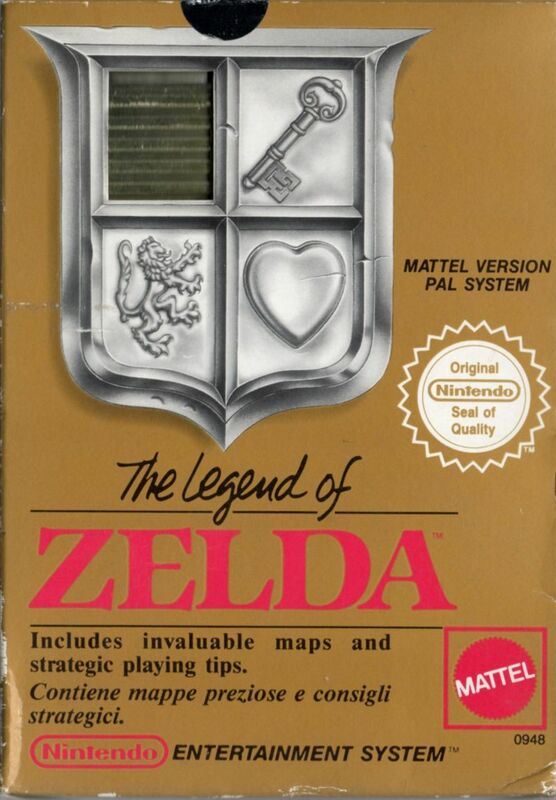 So, let’s take a look at the game that started it all, The Legend of Zelda. 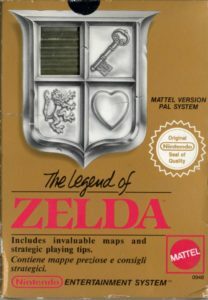 The Legend of Zelda was released in 1987. I was in third or fourth grade at that point, and I really doubt I actually had a Nintendo Entertainment System yet, so I didn’t really play it. 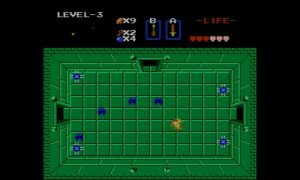 My introduction to the series was Zelda II: The Adventure of Link, and even that I played only in small bits and pieces at a friend’s house. My first real experience with Link, Zelda, and Ganon was The Legend of Zelda: A Link to the Past. Still, I think it’s best to start at the beginning of a series for these retrospectives, at least where I can. I think remakes of the game probably cleaned up the translation some. If I’m being completely honest, I really didn’t expect to like The Legend of Zelda that much, because I remember disliking The Adventure of Link. I started playing it for this post primarily because it’s a historically significant game, as not only the first entry in a classic video game series, but also possibly the first console RPG ever. I expected to play it and appreciate it for that fact, much as I can appreciate the movie Casablanca. I was actually surprised at how much fun I’ve been having. The story is pretty simple. Ganon, the Prince of Darkness, has captured the Triforce of Power and was attempting to get his hands on the Triforce of Wisdom. Princess Zelda managed to split the Triforce of Wisdom into eight parts and scattered them around the world, but she was subsequently captured by Ganon. Now, the hero, Link, must reassemble the Triforce of Wisdom, infiltrate Ganon’s castle, defeat him, and save Zelda. This entire back story is shared in a quick prologue screen before you start your journey. This may be one of the most famous screenshots/quotes in gaming. That’s pretty much it for explanation. Games of this era had very little in the way of tutorials (since it was assumed you had the manual, which was a pretty stupid assumption for an industry that was marketed toward kids who had a tendency to lose everything they touched, but I digress…). You’re dumped into a field next to a cave, and you’re expected to find your way from there. If you go into the cave, you’ll be given a sword, and then you’re off to figure out how to make your way in the world, find the pieces of the Triforce of Wisdom, and save the Princess 1. Once the game has started, you really are given no hints about where to go. Since this is an NES-era game, the “map” is pretty woeful, consisting of a grey screen with a green square indicating which square of the map you’re in. That’s something, but it means you’re in for a lot of wandering. It’s very easy to find yourself in an area that you’re not quite ready for, and the game is pretty unforgiving about that. It’s difficult in any sense, and not quite being certain whether the next screen will bring up enemies you can’t handle makes it even more so. I love Link to the Past, and there are lots of places in this game where the link between these games is practically screaming at you, moreso than between The Adventure of Link and Link to the Past. The dungeon doors look similar, and most of the enemies are familiar, in a way that I have to compare, again, to watching a classic movie and seeing the origin of a lot of the tropes that now seem almost cliched. 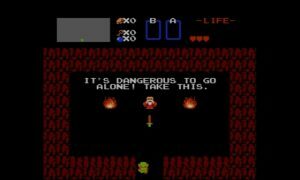 The Legend of Zelda doesn’t hold up to modern games graphically, but there’s a lot to love with its simple depiction of Link and his enemies. Especially if you’re familiar with the enemies from later games, it’s easy to fill in the gaps of the crude graphics to see what the designers were going for (and what the enemies will evolve into). If you enjoy the later Zelda games but haven’t played this one, I absolutely recommend picking it up. You should try it just to respect the series’ roots, but I think you may be pleasantly surprised by how fun this game is, even after thirty years. The Legend of Zelda is available on Virtual Console for both 3DS and Wii U. Screenshots all come from the 3DS. Was there a classic Nintendo series that wasn’t about saving a princess? 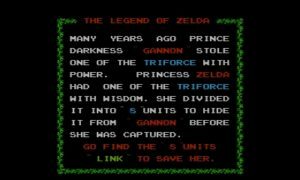 This entry was posted in Video Games and tagged Nerdstalgia, The Legend of Zelda. Bookmark the permalink.